Here are the final results of the class auction project that the fifth graders made. 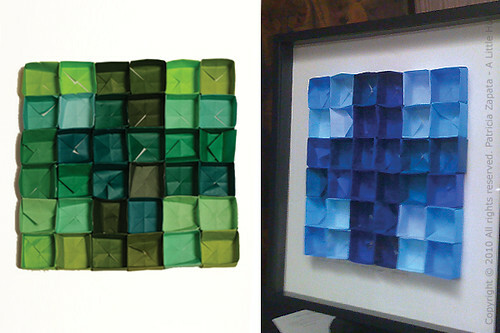 I bought Ikea box frames (30" square) and we used solid colored origami paper. I thought the patterned paper would look too busy for this. 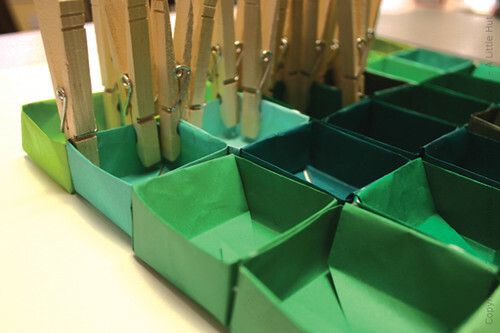 I went to school one day last week and taught the kids how to make a simple origami box (so fun!). One class worked on the boxes for the blue piece and the other class worked on the green ones. It's quite interesting to see the differences in manual dexterity. Nevertheless, they all did great. Clothes pins are great friends! Tacky glue comes in a close second place. 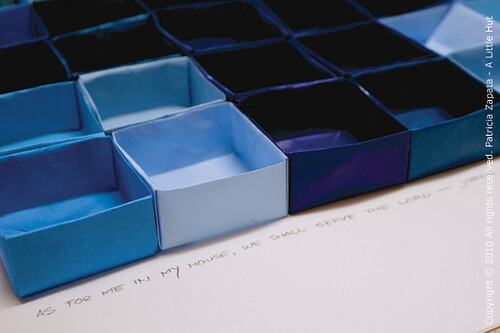 We selected one bible verse for the green piece and one for the blue one. Each child copied the bible verse inside their origami box before folding it (you can't see it - more of a symbolic thing). I added the verse, at the bottom, as the 'title' of each piece. Here are the two final versions. The cross in the middle of each one turned out just as I imagined. I forgot to take a decent shot of the final framed pieces, so I had to settle with a few iPhone photos like the one on the right. I took them this morning where the auction will take place this weekend. I also donated some time to give a Cricut Expressions class as an auction item. We'll see how it goes. I use it primarily with SCAL (Sure Cuts A Lot), but I get so many questions about the machine itself, that I thought a class could be useful and raise some funds for the school. We'll see how it goes! No Friday Tidbits. Sorry!—blame the crazy week and the depletion of brain cells at the moment. I feel so sleep deprived that I could literally go to bed now (sun still shining brightly) and and not wake up until tomorrow morning. Dinner? A neighborhood restaurant will be the provider tonight, thank you very much. Yawn!